Hyper-V dynamic MAC addresses in a clustered configuration has an unfortunate side effect when using pooled desktops with RDS. 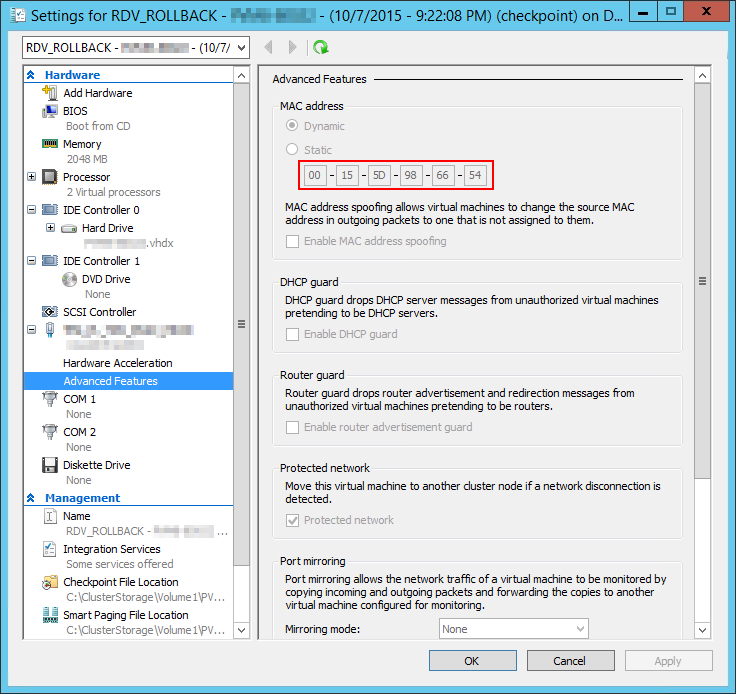 When a pooled desktop is created, Hyper-V creates a checkpoint shortly after the desktop powers on for the first time - this is the mechanism that RDS uses to perform the rollback. When a user is finished with their session and logs off a pooled desktop, RDS creates a task for Hyper-V to restore the checkpoint. This brings the pooled desktop back to it's original state. 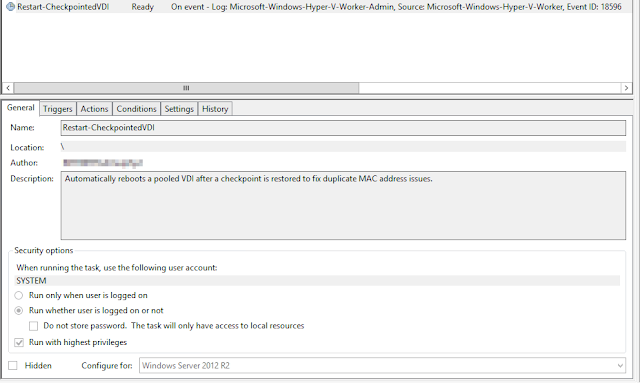 When Hyper-V creates the checkpoint, it stores the MAC address of the desktop in the checkpoint. So each time the desktop performs a rollback, the MAC address reverts back to whatever it was when the checkpoint was created. This causes a problem in a clustered configuration. A desktop that is created on the first node of the cluster gets a MAC address from that node's dynamic MAC pool. 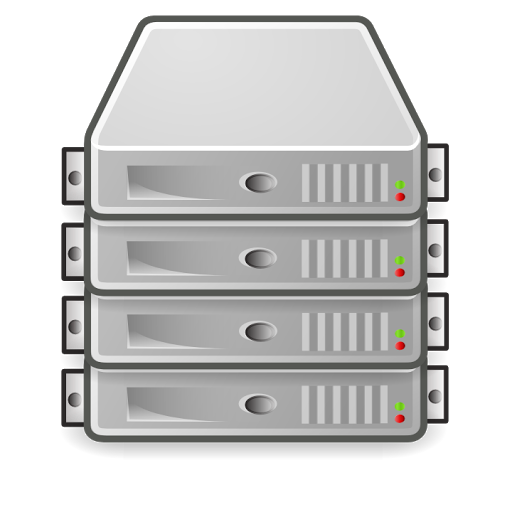 Through the magic of Live Migration, that virtual desktop can move to another node in the cluster. Now that the pooled desktop is on a different node, the first node of the cluster can reallocate that original MAC address from it's pool, since no desktop on the first node is using it. See the problem? The first node will give that MAC address to a new VM, however the pooled desktop on the second node will revert to that same MAC address when performing the rollback. Voila! You now have a duplicate MAC address in your environment, which can cause issues with layer two switching, as well as DHCP. Now, if you have SCVMM in your environment, it attempts to resolve this issue by allowing you to define a static MAC address pool that all hosts in your cluster can pull from. Again, this is a great solution for regular VM's, but doesn't work so well with RDS in the picture. If your template virtual machine is set to a static MAC address, RDS will throw an error when you try to create and/or update the pooled template. RDS doesn't want to create multiple virtual desktops all with the same static MAC address, so it forces you to use dynamic MAC addresses and will not continue until you change your template VM. I've developed a workaround for this behavior that prevents the creation of duplicate MAC addresses in the environment. We know that when the rollback occurs, the MAC address of the virtual desktop may change, causing the problem. By using PowerShell, we can modify the MAC address inside the checkpoint, and "blank" it out - this will cause the virtual desktop to grab a new dynamic MAC address from the host it currently resides on each time that a rollback occurs. However we're not quite done yet. When we make this change, we're forcing the virtual desktop to change MAC addresses while it's still technically running, which doesn't quite work. The virtual desktop will grab a new MAC address, but all network connectivity will be lost until we reboot the desktop. We certainly don't want to sit around all day rebooting virtual desktops. 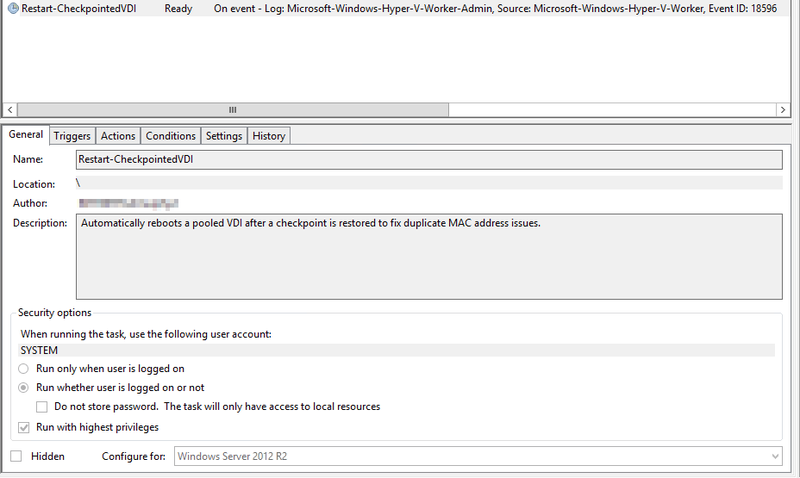 Luckily, Hyper-V logs an event whenever a checkpoint is restored. We can create another simple PowerShell script to reboot the virtual desktop, and use Task Scheduler to trigger this script whenever the rollback event is logged. The PowerShell script is pretty simple. First we need to find the specific event log entry that triggered the script. We do this by passing the eventChannel and eventRecordID as parameters. When Task Scheduler triggers the script, it will pass this information into the script (we'll set this up next). We can then use the Get-WinEvent cmdlet to retrieve the specifc event entry we're looking for. Once we have the event entry, it's as simple as looking inside the message of the event and grabbing the name of the virtual desktop. Now that we have the name of the virtual desktop, we can use some Hyper-V cmdlets to force a reboot of the virtual desktop. Here is a link to my GitHub repository for the scripts - Restart-CheckpointedVDI on GitHub. To trigger the script correctly, Task Scheduler needs to pass the eventChannel and eventRecordID to the script - this does not happen natively. I found a slick TechNet blog post detailing how to set this up - http://blogs.technet.com/b/wincat/archive/2011/08/25/trigger-a-powershell-script-from-a-windows-event.aspx. However for ease of use, I've also included an XML file you can use to import the scheduled task for you (Restart-CheckpointedVDI on GitHub). Simply modify the path to the script in the argument section of the Action tab and the scheduled task should be all set. A user finishes their session and logs off of the pooled desktop. RDS sends a task to Hyper-V to initiate the rollback. Hyper-V stops the VM, applies the checkpoint, and restores the VM. 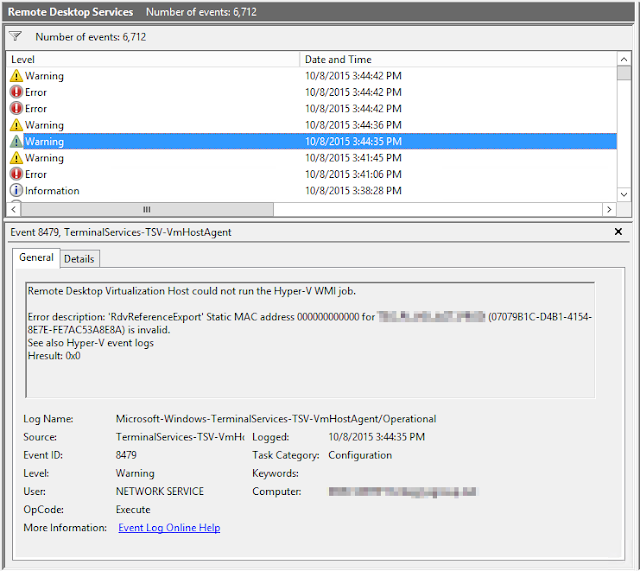 Hyper-V logs event ID 18596 in the Microsoft-Windows-Hyper-V-Worker/Admin event log. Task Scheduler is triggered by the event and launches the reboot script. The reboot script grabs the event that triggered it based on parameter input, parses the virtual desktop name, and reboots the desktop. This entire procedure occurs over the course of 15-30 seconds, depending on how fast your Hyper-V virtual infrastructure is. It's unfortunate how Hyper-V dynamic MAC addressing works in a situation such as this. It's also unfortunate that Microsoft chose to implement static MAC address pools as part of SCVMM. If RDS were able to integrate more tightly with SCVMM and grab a MAC from the static pool, that would solve this problem. Ideally, Microsoft should have implemented a static MAC address pool directly as part of Failover Clustering, so customers of all sizes could have access to a single standardized pool of MAC addresses, preventing DHCP conflicts in scenarios such as RDS pooled desktops. VMware already does this in a standardized fashion by centrally managing MAC address with vCenter - a standard part of any size VMware deployment. It's clear that the Hyper-V, SCVMM and RDS teams at Microsoft are not all on the same page on this issue. thanks for the script it works great .Just a question do you know of a way to see what addresses are available in the pool for assignment?